Price Drop! Was: $299.95 Now: $279.96. For a limited time only, while stocks last. 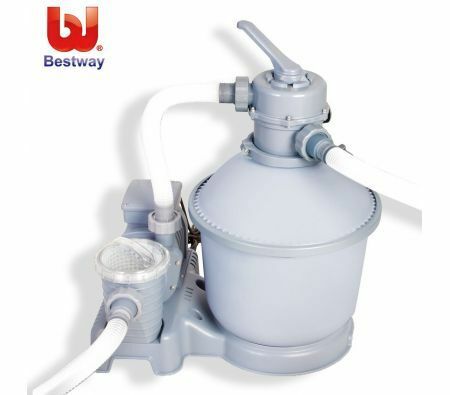 Get crystal clear water with the Bestway 1,000gal Flowclear Sand Filter. This pump is the ideal solution for maintaining the cleanliness of your swimming pool water. The water flows into the sand filter then to the debris screen and then into the sand bed thoroughly cleaning your water. Easy to set up and maintain this affordable compact filtration system is perfect for above ground pools. This sand filter is an environmentally and friendly cost-effective way to keep a continuous flow of clean, clear water circulating in your pool. This durable pump lasts a longtime and eliminates the need for filter cartridges.